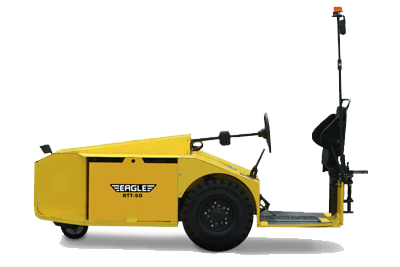 Extremely efficient, 80V A/C electric tugger that can tow up to 50,000 lbs. Fully adjustable seat for both Stand-up and Sit-down operation. Designed to be used with optional "smart charge" battery and charger systems to allow for opportunity charging at shift changes and breaks to provide 3 shifts of operation without having to change batteries. Eagle Tugs proudly introduces this new generation of electric tuggers that are energy-efficient, ergonomically-correct, and flexible enough to meet material handling needs across multiple manufacturing and distribution platforms. At the request of a major U.S. auto manufacturer, Eagle Tugs accepted the challenge of creating an industrial tugs that would allow them to standardize their global fleet. After years of research and design, with the collaboration of ergonomic and safety engineers and continuous feedback from tow tractor operators worldwide, the Eagle RTT-50 Electric Tow Tractor was born. The RTT electrical tugger was designed to maximize reliability and reduce unproductive "downtime." With its solid steel plate construction and its vibration reducing front and rear suspension, the RTT features an unsurpassed 1,000-hour Preventative Maintenance schedule. Adding to the RTT's reliability is its high-efficiency A/C electric drive, which requires no preventative maintenance. When you team this with a "Smart Charge" battery and charger, the result is a material handling tool with unparalleled productivity that can streamline any operation. By choosing Eagle RTT electric tuggers as the standard for your entire tow tractor fleet, the result reduces the cost of ownership by having one set of replacement parts, less maintenance personnel, and reduced operator and maintenance training time. We also carry other electric tow tractor models including the RTT-12 Electric Tow Tractor, RTT-18 Electric Tow Tractor, and the STT-18 Electric Tow Tractor! Get a quote now! Instruments Display showing Speed, Battery Life, Hours & Diagnostics.